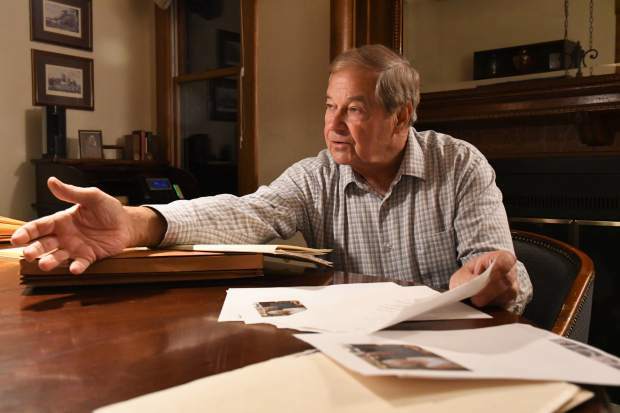 Steve Beattie speaks of his fondest memories of his father, Lyle Beattie, at his law office in downtown Glenwood Springs on Tuesday. 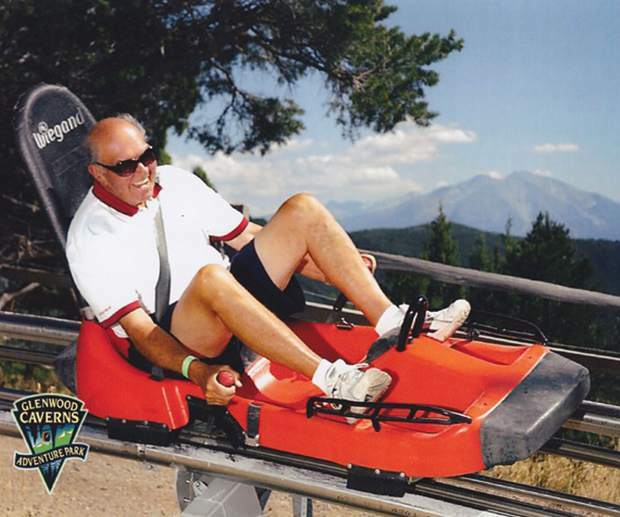 Lyle Beattie riding the Alpine Coaster at the Glenwood Caverns Adventure Park. Lyle Beattie and his second love Roberta. 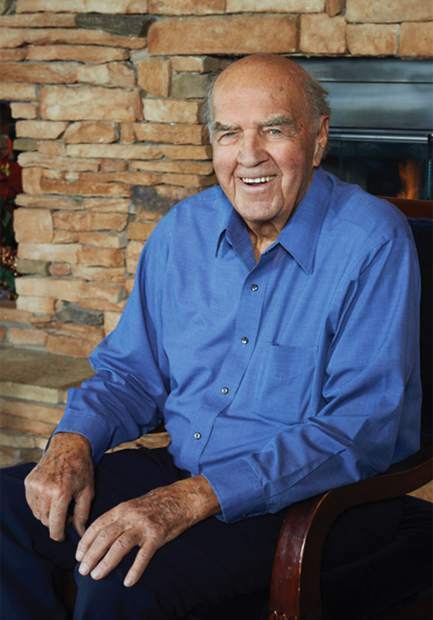 Family, friends and associates of Lyle Wayne Beattie, who died of pancreatic cancer in Glenwood Springs on Sunday, remember him as the quintessential gentleman, an exemplar of the Greatest Generation, a dedicated father, scrupulous businessman, a sportsman and a civic-minded leader who sought the good for everyone he met. 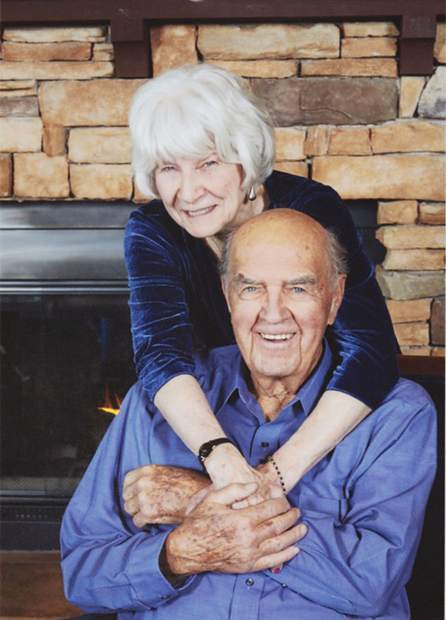 Born in Boulder in 1923, Lyle and his family became fixtures of the Glenwood Springs community after moving here in 1953. “He figured, if you’re going to be in a place, you might as well do it right. If you’re going to be a part of something, go full-tilt,” eldest son Steve Beattie said. He was on the Glenwood Springs City Council in the 1960s, including two years as mayor. He also was a board member of the Chamber of Commerce, including a stint as chairman. And his roster of leadership roles includes Kiwanis Club, the First National Bank board of directors, the First United Methodist Church Administrative Council, director for the Westbank Ranch Homeowners Association and president of two golf clubs. Feb. 19, 1944, was a big day for Lyle. He finished a final at CU-Boulder, received his commission in the Navy and married Patsy Jean McCauley. He served as deck and engineering officer on the USS Lang as its crew supported the battle of the Mariana Islands and the liberation of the Philippine islands. When the Lang was decommissioned after the war in October 1945, Lyle “had the honor of standing the final watch and was the last man down the gangplank,” according to the World War II memorial register. After the war, Lyle earned his master’s degree in aeronautical engineering from CU. 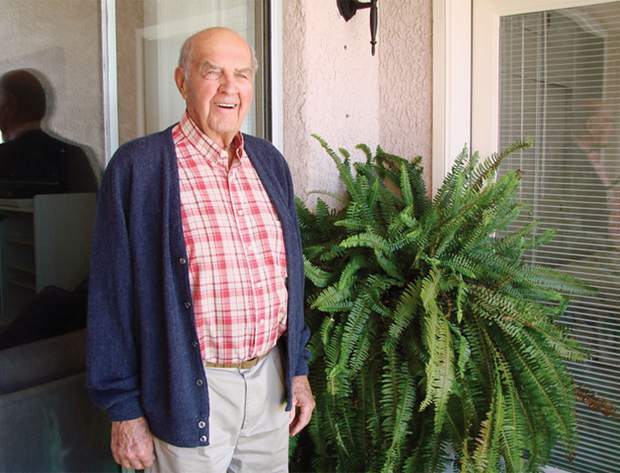 In 1953, Lyle moved from Santa Monica, California, where he worked as a wind tunnel test engineer for Douglas Aircraft, then to Glenwood Springs where he started L-P Gas and Appliance Co. with his late brother, Hal. He and Patsy raised four children in Glenwood: Steve; Lorie, who married John Courier; Kerry, married to Steve Smith; and Brent, who died in 2014. Lyle’s scrupulously honest and moral approach to business is exemplified by his actions during the shale bust of the 1980s, according to his children. 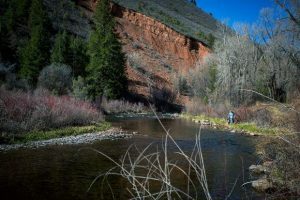 The recession hit Western Colorado particularly hard, and as a real estate developer with a number of capital projects in the mountains, Lyle faced tough times himself. “But he was one of those that honorably worked out every debt and obligation, because that’s what you did,” Steve Beattie said. “Whatever his obligations were, he worked and worked until he honorably resolved every problem that he ever had,” daughter Lorie said — even though many other businessmen were declaring bankruptcy in the wake of the recession. Lyle’s children had personal examples of their father’s love — helping them move or build patios or work through relationship challenges. Kerry remembers Lyle moving her down to Mexico when she got married, and driving down again to move her back to the states when the marriage broke up. But perhaps the most touching example was Lyle’s support of his youngest son Brent, who died of an apparent heart attack in November 2014 at age 58. Lyle’s love didn’t stop at his own children. “He was like a second dad to me,” said Vicki Nelson, whose family lived near the Beatties in the 1960s and ’70s. “Over all these years, I was most impressed with the clarity of Lyle’s mind. He had a lot of common sense and knowledge, and he carried that throughout his life,” said Floyd Diemoz, who built the Beatties’ house in Westbank and knew the family for several years. Members of the Glenwood community respected Lyle’s level-headed approach to issues so much that, in 2013, nearly 50 years after his time as mayor, a group of local business owners convinced him to run for council again. “He had a lot of institutional knowledge about the city and was really sharp. 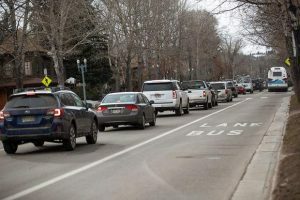 He had a good perspective on things,” said Marianne Virgili, a member of Lyle’s campaign and a former director of the Glenwood Springs Chamber Resort Association. “He was very clear about the role he would take and the way he would conduct himself as a public servant,” Virgili said. When Lyle was drafted to run, he didn’t know his opponent would be Stephen Bershenyi — a Glenwood Springs native who Steve and Lorie remembered from school. Lyle was ever the “quintessential gentleman,” Lorie said, and that was proved in the campaign and during a televised debate between the two candidates. 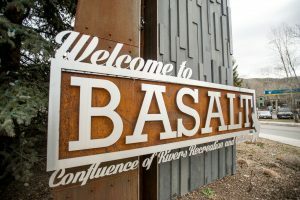 When Lyle lost that bid for City Council to Bershenyi by 27 votes, he “was disappointed, but he still went on and continued to volunteer in the community,” Virgili said. “He told me once that, in Glenwood Springs, business leaders would serve on City Council when it was their turn. It was considered their duty,” Virgili said. 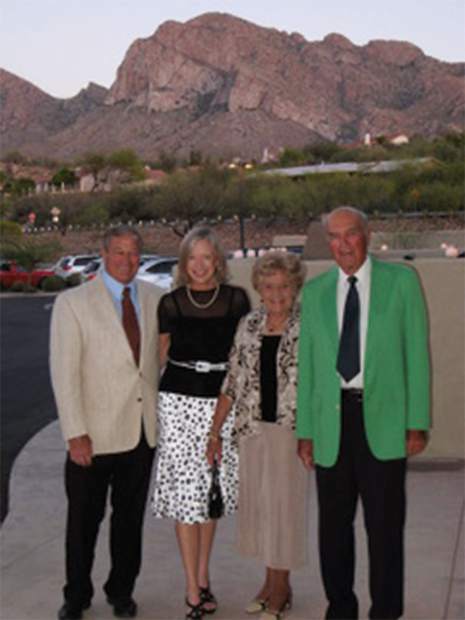 Lyle and Patsy split their time between Colorado and Arizona through the 1980s and ’90s. Patsy Beattie died in February 2010, and Lyle continued to be active in the community. That June, he was the grand marshal for the Strawberry Days parade on the 125th anniversary of Glenwood Springs. Lyle continued his volunteer activities and even worked at the Glenwood Caverns Adventure Park well into his 90s, where his supervisor was Steve’s son Wade Beattie. “He’s 94, so he wasn’t up on the ladder, though,” Shute said. Lyle found his second love among the church members. He married Roberta Turner in June 2017, when he was 93 and she was 81. Both were active in senior sports and enjoyed outdoor activities, Steve said. They volunteered at the church, including helping grow the pumpkin patch, and fed the needy at Lift-Up’s Extended Table, among other things. Roberta complimented him on the comments, and on his picture as a young man. “I told him his picture was cute,” Roberta said, and she remembers touching Lyle’s arm. That touch sent a jolt of electricity, a wave of something special through Lyle, Steve remembers. Roberta was not certain of that. “That’s what he said, but who knows,” Roberta said. “That’s what he said, and you know him to be an honest person,” Steve said. “Well, that’s right,” Roberta replied.